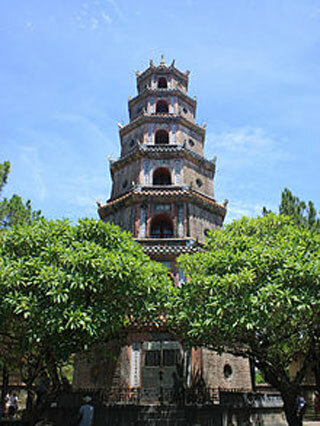 The Pagoda of the Celestial Lady (also called Linh Mu Pagoda) is a historic temple in the city of Hue in Vietnam. Its iconic seven-storey pagoda is regarded as the unofficial symbol of the city, and the temple has often been the subject of folk rhymes and ca dao about Hue. Built in 1601 on the order of the first Nguyen lords, Nguyen Hoàng, who at that time was the governor of Thuan Hóa (now known as Hue). This article uses material from the Wikipedia article "Pagoda of the Celestial Lady", which is released under the Creative Commons Attribution-Share-Alike 3.0 License.